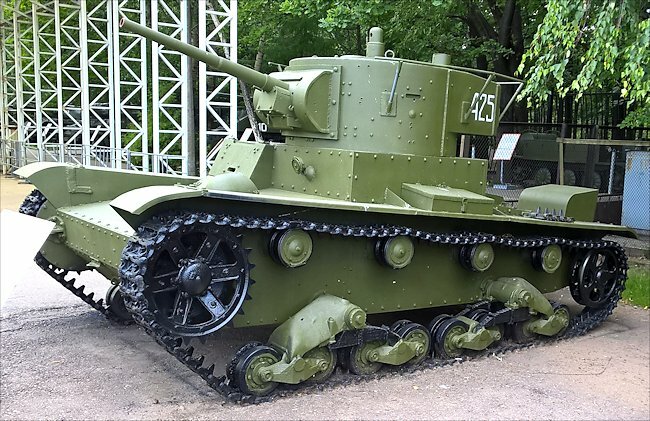 This Soviet T-26 Model 1933 Radio tank can be found at the Central Museum of the Great Patriotic War 1941 - 1945, Park Pobedy, Moscow, Russia. This tank was visually modified to look like a T-26 tank. It uses a hull from a Polish C7P tracked artillery tractor, which was most probably used by German troops on the Eastern front in 1942. It was recovered near Volgograd by the 'Ekipazh' search party in 2004. It also carries a BT-5/BT-7 m1935 turret. It has very few parts from a real T-26. The rear idler wheel comes from a BMP-1. The ring of metal that goes around the top of this T-26 Soviet Light tank is not a hand rail for infantry to hold when getting a lift to the battlefield by a friendly tank commanders. It is the tanks radio aerial. Most T-26 Russian tanks did not have a radio set. They communicated with other tanks by shouting, signal lamps, signal flares or flags. The troop commander's tank was fitted with a radio so he could get orders from headquarters and send back reports. He could not communicate with tanks under his command using his radio. When the Germans invaded Russia on 22nd June 1941 as part of Operation Barbarossa the T-26 light tank was the most numerous Soviet tank on the battlefield. The German army was equipped with Panzer IIs, IIIs and IV tanks. They also used Panzer 35(t) and 38(t) tanks as well as some captured tanks. They had around 3,350 tanks. The Soviet Army had a much large tank force on paper. It consisted of over 22,000 armoured vehicles although it is believed that only 11,000 tanks faced the Germans on the frontline west of Moscow. Most of the Russian tanks were obsolete and no match for the German medium tanks. 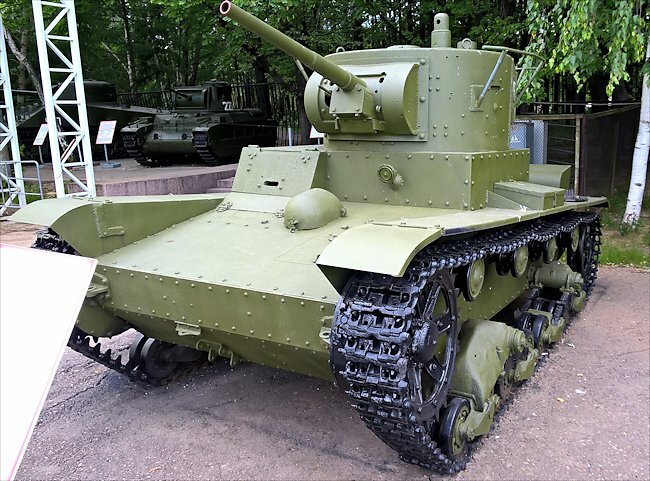 Production of the T-26 tank started in 1931 and finished in 1941. A total of 10,117 had been produced during that time period. This included 2,038 Twin-Turreted T-26 tanks, 4,192 T-26 tanks with a single turret and 3,887 T-26 tanks with a single turret and radio. The Russian KV-1 and T34/76 tanks were more advanced thant the German tanks but were not available in large numbers. The German tank commanders soon realised that the enemy T-26 tanks with the circular rail around the turret signified that this was a unit commander's tank and fitted with a radio. Orders were given to destroy these tanks first the idea being is the soviet tank forces would not fight as efficiently if they had no leaders to tell them what to do. As more and more T-34/76 medium tanks rolled off the factory production lines they replaced the front line armoured division's T-26 tanks. Some T-26 tanks took part in battles with the Germans and their allies during the Battle of Moscow in 1941–42, the Battle of Stalingrad and the Battle of the Caucasus in 1942–1943. 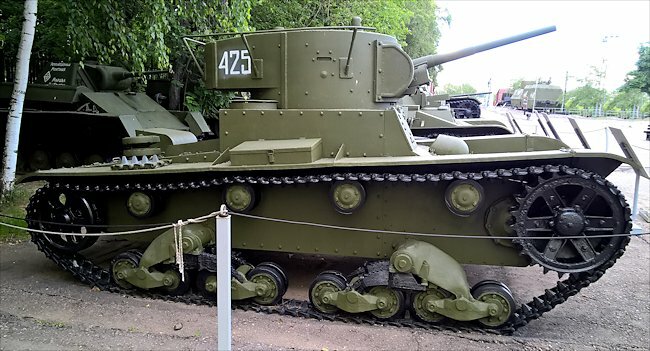 Some tank units of the Leningrad (St Petersburg) Front used their T-26 tanks until 1944. It had a three man tank crew; commander, gunner and driver. The tank was powered by a 4 cylinder gasoline (petrol) flat air-cooled engine that produced 90 hp. This enabled the tank to drive at a maximum road speed of 31.1 km/h (19.3 mph) and at 16 km/h (9.9 mph) off-road. Its 290 litre fuel tank gave the tank an operational range off-road of 130-140 km (81-87 miles). If it only drove on roads it had a range of 220 - 240 km (140 - 150 miles) on a full tank of fuel.